I pointed to the video above by The Nerdwriter in class today to highlight the point that the page is the fundamental unit of communication for Maus, maybe for all comics. It's a really interesting video, for a number of reasons — and it also touches on the sort of analysis I’ll be asking you to carry out for your major project on Maus, so you should definitely watch it carefully. Nerdwriter's argument overlaps, as the quote to the right points to, with Hillary Chute's in a number of ways. How is it different for him to make such an argument in the medium of a YouTube video essay as opposed to when Chute makes her argument in an academic book? What can you discern about Nerdwriter's rhetorical situation -- including that question of medium, but also the genre he chooses, his audience, purpose, and context -- as opposed to Chute's? What do you notice about the way the two authors go about making their arguments? When you make your own arguments on your web sites, you'll be working in still a different medium, in a different genre, with your own purpose, audience, and context. What aspects of these two authors' arguments about Spiegelman's Maus might you choose to emulate? Feature image: gif that I created from selected scenes in "How to Design a Comic Book Page." "all-at-onceness": my handwriting (sort of). 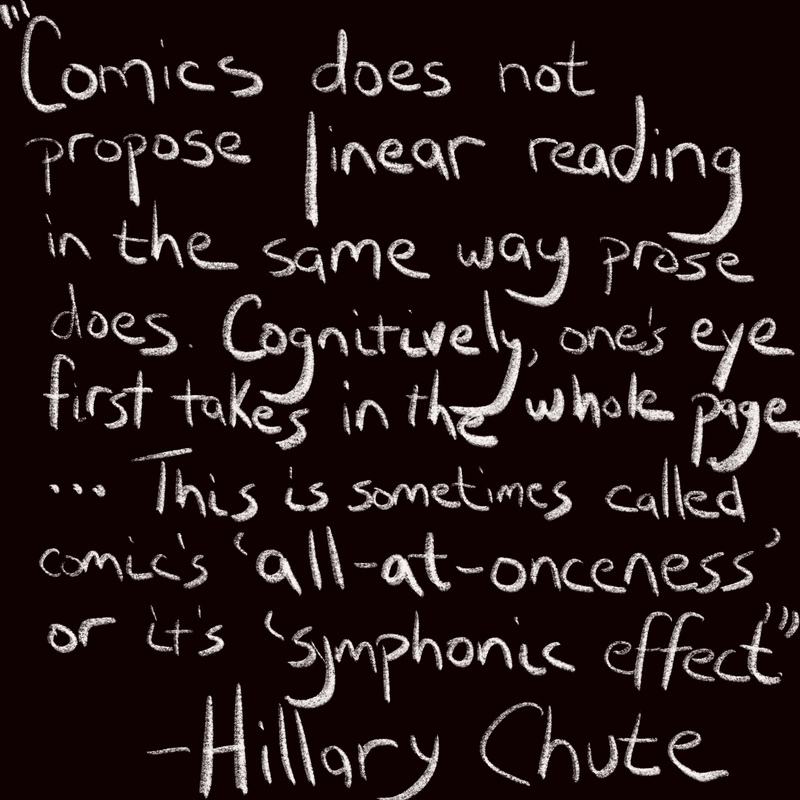 Quote from Hillary Chute, Why Comics? From Underground to Everywhere. Harper Collins, 2017. p. 25.